1.Hi Geovanny! You have been at EC for a few months. How is your experience so far? 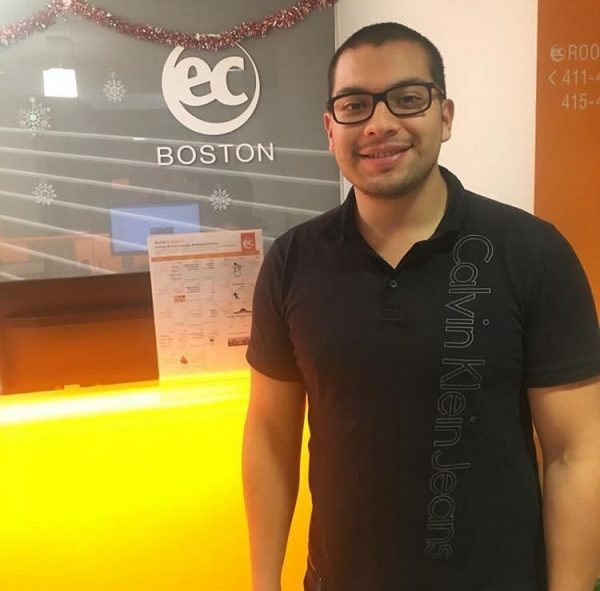 I have been studying at EC Boston around four months and I have met a lot of new friends from other nationalities, definitively has been the most exciting experience in my life. 2.What level did you start with and where are you now? My first level was Intermediate and now I’m in Advance level. I have learned and improved my English extraordinarily during this time. Teachers and all the staff are very professional, they do the best for you. Thus, you will have an excellent learning experience. 3.How is your experience as a student ambassador? 4.What is your favorite part about living in Boston? My favorite part of living in Boston has been attending the different sports games. For example, one of my favorite activities has been attending an NBA Celtics game at the TD Garden Arena! it’s awesome and in my opinion I like this team since I was a child and had seen them play has been one of my dreams. 5.What advice can you give someone who is trying to learn English? My advice is that you should practice your English all the time in different situations, inside and outside the school. Your incredible teachers will help you, and keep practicing with your friends. Also, follow and be encouraged from the success of other students! Get ready to enjoy one of the best experience in your life!! EC wants to wish everyone a Happy Earth Day! Boston runs the 123rd Boston Marathon!